Although this isn’t a wedding invitation, it such a fun invitation I wanted to post it. Molly contacted BB10 Creative looking for some fun invitations for her sister’s 40th birthday party. 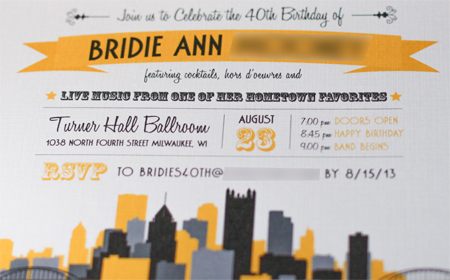 She and her sister were raised in Pittsburgh but currently reside in Wisconsin and she was looking to incorporate a Pittsburgh theme in the invitations. 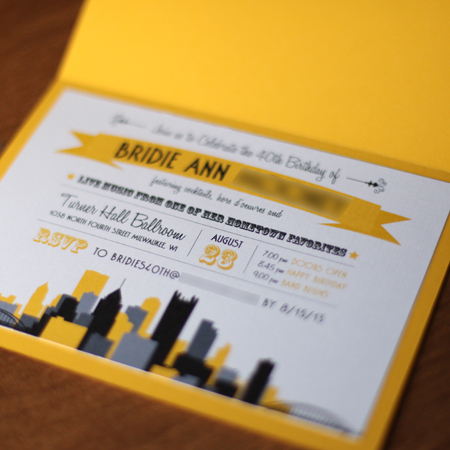 Having recently finished a set of Pittsburgh theme wedding invitations, I still had the city research fresh in my mind. I immediately knew I wanted to use gold and black color scheme since those colors are very representative of Pittsburgh and it’s 3 sports teams. The resulting invitation was a simple folded card using a bright gold cardstock and was mailed in a dark black metallic envelope. 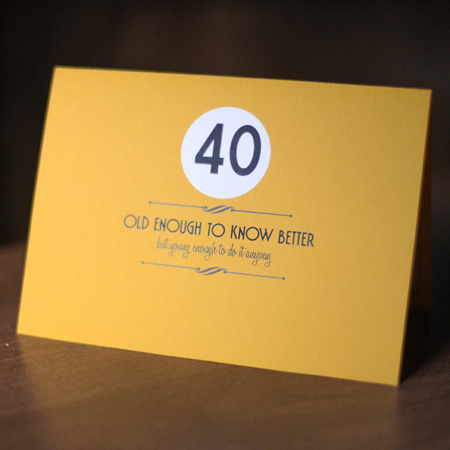 I used the number 40 in a circle shaped sticker and included the phrase “Old Enough to Know Better, But Young Enough to Do It Anyway.” Cute but not too cheesy, right? Inside, I printed the invitation on white linen cardstock and adhered it to the yellow cardstock. The design features a solid, multi-colored skyline of Pittsburgh, complete with bridges, and a fun retro type treatment for the text. The birthday girl’s name is highlighted in a yellow banner. Overall these turned out really well and were a great introduction to what I can only imagine was a really fun 40th birthday party! 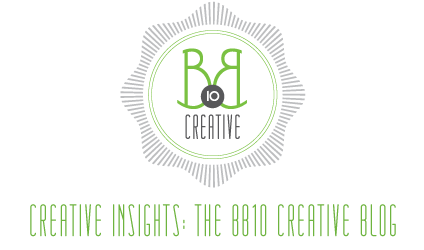 Just a reminder that BB10 Creative can accommodate all types of invitations and announcements, not just weddings! More to come soon!